My mother thinks I’m weird. I do odd things like make my own soap. Well, I repurpose bar soap that we’ll never use into liquid soap that we need. Now, pennies are not so tight around here that we can’t afford to buy hand soap, but saving a few on liquid soap allows us to put those pennies towards things we really want, like Nutella and Smartphones. Now, for the record, I didn’t come up with this method. I googled it last summer and combined several “recipes” to come up with this method. Anyway, making your own liquid soap out of bar soap isn’t as hard or as fun as you think it will be. Ha. 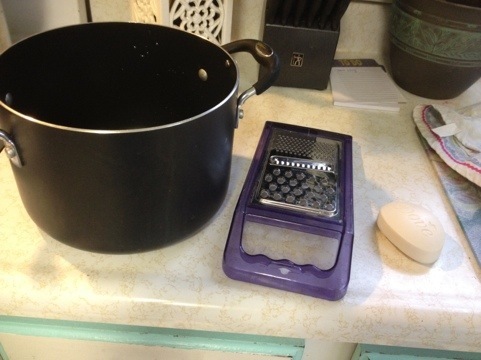 You need four things: bar soap, cheese grater, large pot, and water. Apparently you can add some glycerin or something, but I’ve never done this and my stuff’s turned out fine. 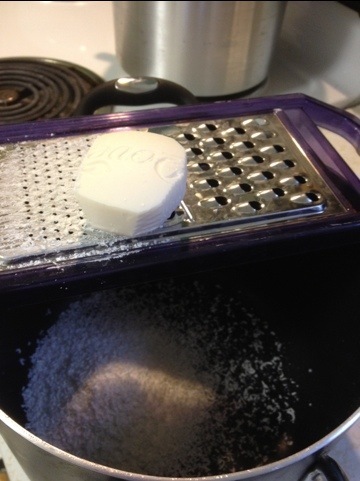 Grate the soap over the large pot with the cheese grater. This will take a long time. Your arm will get tired. Remind yourself that the Proverbs 31 woman has strong arms. Continue grating. Don’t breathe in the little soap sprinkly things. Apparently those can hurt you. So don’t do that, m’kay? Keep turning the soap bar over and over again so that it gets used on all sides. Again, this is going to take a while. Maybe 20 minutes of just constant grating. You will survive. As long as you don’t breathe it in. Then you’re on your own. Whew. You did it. You turned the bar of soap into little soap sprinkly things. Excellent work. Take the pot over to the sink and fill it up with water. 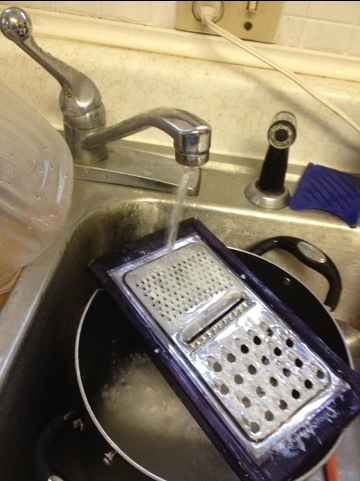 I used the water to wash the soap off the cheese grater because, hey, more free soap, right? Okay, so now you just boil it for a little while and stir it. The little soap sprinkly things will sort of melt into the water. Now the easy part: you wait. Stir the soap and let it sit for a few days. Yeah, I said a few days. Stir it when you walk through kitchen every once in a while. It will thicken up over a day or so. Then you’re on your own. Sometimes I use a funnel to pour it in and sometimes I just dip the bottles into the soap. Generally it makes a giant mess, but hey, it’s soap, so it’s a clean mess :). See, what’d I tell you, making your own soap is not so bad. Oh, by the way, this makes A TON of soap. Save your containers because you’re going to need them.